Throughout my adult life I have been committed to the pursuit of a career as an educator. Since beginning my journey as an elementary school teacher six years ago, I was fortunate to have been exposed to a wide range of teaching scenarios, diverse school communities, curriculums and student needs. These experiences have helped me to grow in my role as a professional educator and have afforded me an opportunity to demonstrate leadership both in and outside of the classroom. Throughout my career I have demonstrated professionalism, dedication and a proven track record of success in a variety of classroom environments. 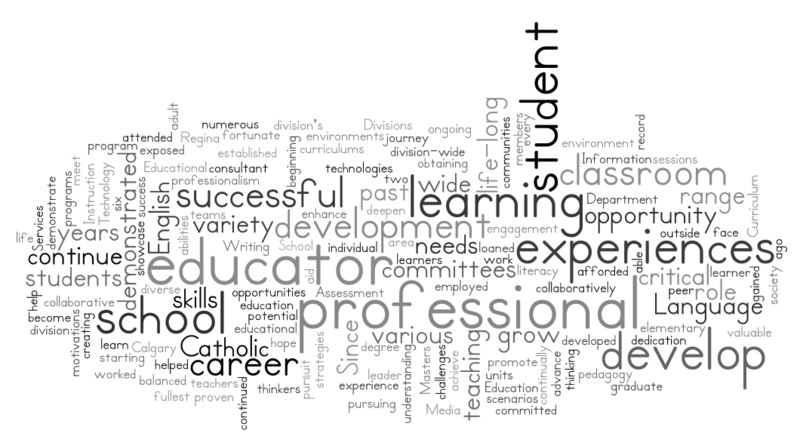 I have been employed by the Calgary Catholic and the Regina Catholic School Divisions where I have gained valuable experience working on collaborative teams and committees established to advance English Language Arts and Educational Technology programs. Throughout these experiences I have demonstrated my abilities as an educational leader. Through various professional development, committees, and peer groups, I was able to not only learn about various technologies and strategies to enhance student learning and engagement, but also showcase my own experiences and skills. In the past two years, I have worked with our school division English Language Arts consultant to develop a balanced literacy program in my classroom, units that are loaned by our school division’s Information and Media Services Department, and collaboratively work with a variety of teachers to develop a division-wide Writing Assessment. Through these past experiences and my own professional development, I have been successful in creating an environment where every student is successful and has the opportunity to achieve their fullest potential. My motivations for pursuing a graduate degree and continued life-long learning are to grow and develop as an educator so that I can continue to meet the wide range of individual needs and learning challenges that my students face, and to continue to develop my teaching pedagogy. Since starting my career as an educator, I have continually developed as a learner and professional and have attended numerous professional development sessions and ongoing education opportunities to aid in this process. My role as an educator is to promote student learning and critical thinking skills. By obtaining my Masters of Education in the area of Curriculum and Instruction, I hope to deepen my understanding of how to help my students become critical thinkers, life-long learners and successful members of society.